At the end of World War 1, many returning servicemen took up soldier settler blocks in Canberra and elsewhere to start their new peacetime lives as farmers. The pastures of Tuggeranong did not, however, stay peaceful for long. In 1941, the Department of Defence established a practice bombing range in the sheep paddocks used by farmers Mervyn Edlington and Edward Oldfield. Files on the Tuggeranong Bombing Range, and its subsequent clean up in the 1970s, are ArchivesACT's Find of the Month. The histories of Canberra and Australia's Defence Forces have been intertwined since the foundation of the ACT. Soon after the Commonwealth resumed land from New South Wales in 1911 for the creation of the Federal Capital Territory (FCT), it also established the Royal Military College at Duntroon. Duntroon was the first of many areas of the ACT set aside for military purposes. In addition to this and other well-known permanent facilities, there have been several lesser-known Defence uses of Territory land. During wartime in particular, the Commonwealth resumed many small areas of the ACT for specialised military use. In World War 1 the Commonwealth began planning the construction of an arsenal (a weapons storage facility) close to the Murrumbidgee River near Pine Island. It also planned an expansion of Tharwa village to accommodate the arsenal's workers. While the construction of this facility never eventuated, the proposed site did become Soldier Settlement Block Lanyon 4A in 1920. The neighbouring Soldier Settlement Block Lanyon 10A, now the location of the Canberra suburbs of Bonython and Isabella Plains, was given a specific role during World War 2. In 1940, the RAAF used the block as a practice bombing range. 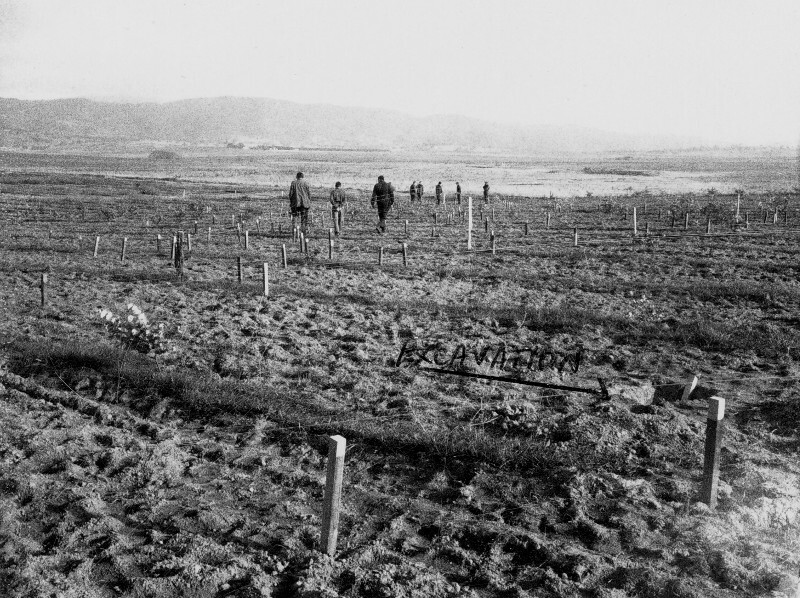 After World War 1 the Commonwealth Government acquired 9,000 acres (3,642 hectares) of land in the ACT for a Soldier Settlement Scheme which provided returned servicemen with access to rural land and low interest loans. Within the ACT, the Federal Capital Commission (FCC) granted this land to the soldier settlers under a leasehold tenure system for periods ranging from five years to twenty-five years. Alexander George Allmann Powell secured the Soldier Settlement lease of the 939 acre (380 hectare) Lanyon 10A in April 1920. Powell worked this property until surrendering his lease in 1927 to local grazier, John Edlington, where it formed the basis of his property called Aroma. When John Edlington passed away in 1939, the Department of the Interior (DOI) granted quarterly leases of Lanyon 10A to his son Mervyn Edlington and a neighbour, Edward Oldfield. In December 1940, the DOI informed Edlington and Oldfield that "it has been arranged to establish a Bombing Range for the RAAF, Canberra, in your district and your lease of Block 10A Lanyon has been selected for the purpose." 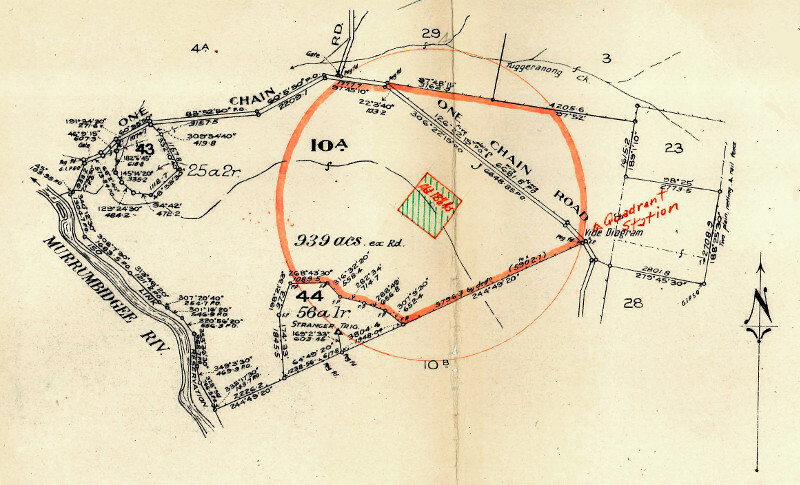 In January 1941, under the conditions of their lease, the DOI withdrew an 18½ acre (7½ hectares) square from the lease and fenced it off as a target area. The Department then wrote to lessees that the practice bombing would drop "non-explosive bombs weighing about 8lbs" (3.6kg), and that "the possibility of loss to stock or human life is said to be negligible." The first practice bombings took place between the 22nd of January and the 10th of February 1941, between 7am and 6pm. Initially the RAAF agreed to warn lessees when any practice would take place, as well as to advertise in the Canberra Times. 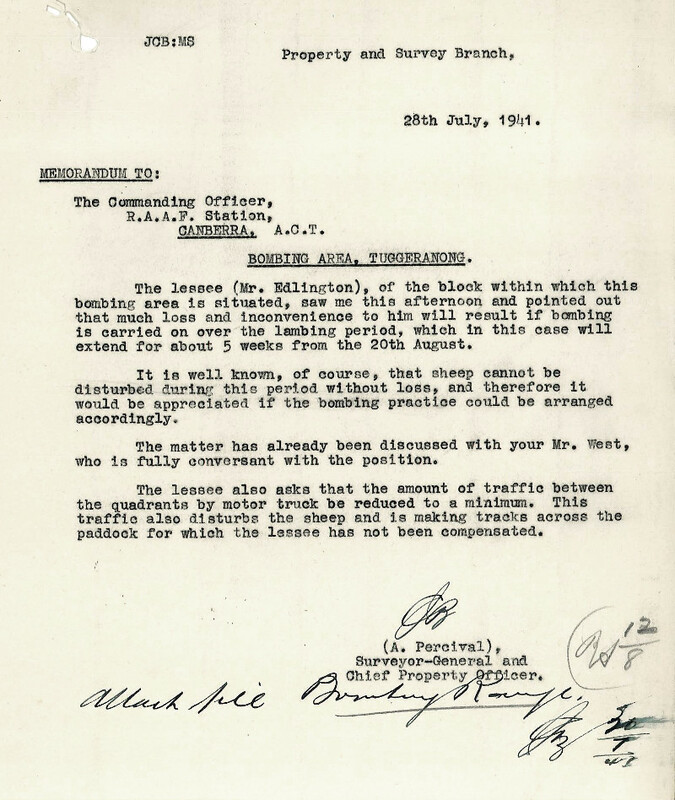 However, in October 1941, RAAF Station Canberra revoked this agreement stating "no warning will be given by this Station" and that "lessees can usually ascertain a day in advance from the Station Armament Officer whether firing or bombing will be carried out." "It is well known, of course, that sheep cannot be disturbed during this period without loss, and therefore it would be appreciated if the bombing practice could be arranged accordingly." The RAAF obliged by ceasing practice for the five-week lambing period during August and September 1941. In addition to the Tuggeranong bombing range, there was also an armament range at Majura where the military used live munitions. 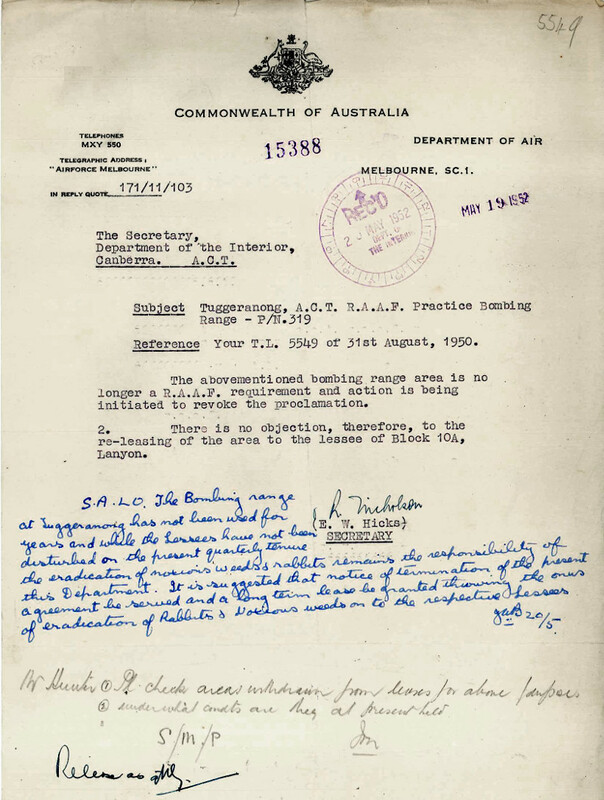 Despite initial assurance from the RAAF that "the element of risk to human life was not great", DOI Inspector of Lands and Stock, James Brackenreg, who supervised the management of rural leases, was alarmed to hear reports to the contrary in September 1941. The RAAF Armament Officer informed Brackenreg, "There is grave danger to human life under existing conditions" and he believed the DOI should have withdrawn the whole bombing range at Majura including the larger danger zone from the rural leases. 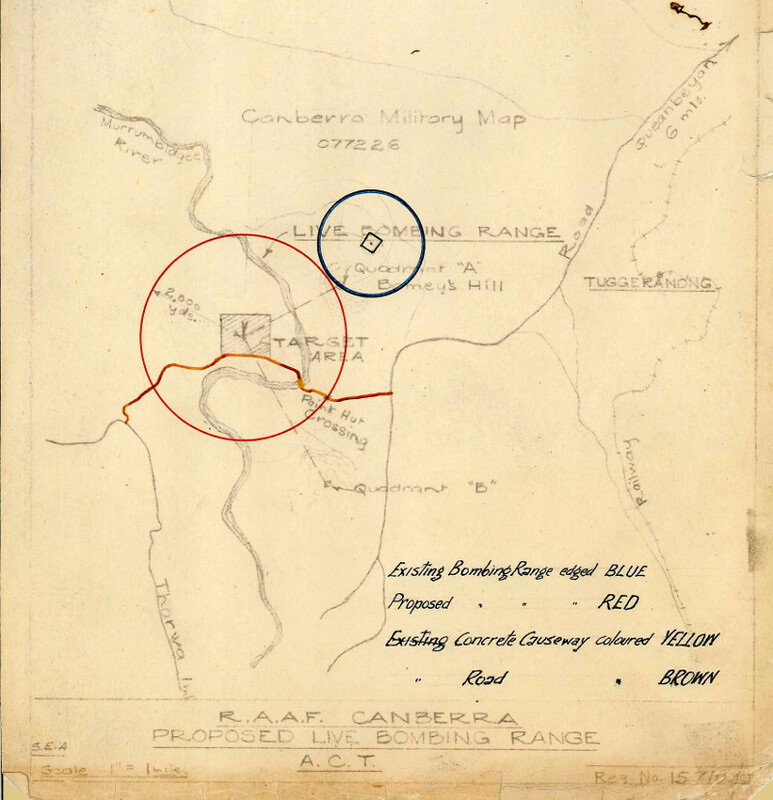 With regard to the Tuggeranong bombing range, Brackenreg concluded that "whilst the position there is not so serious", the 18½ acre target area was insufficient. DOI officers reported, "many bombs fall outside the target area, but within the danger zone" and recommended the resumption of the lease of this larger area. In April 1942, the DOI withdrew the additional 450-acre (182 hectare) danger zone from the lease of Lanyon 10A. This danger zone also included small sections of neighbouring properties, having a combined area of 603 acres (244 hectares). Despite the potential hazard, the Department determined that the lessees could continue to "graze with sheep free of charge at any time the land withdrawn is not required for use by the RAAF." The Department also promised to compensate the lessees for any livestock injured or killed. 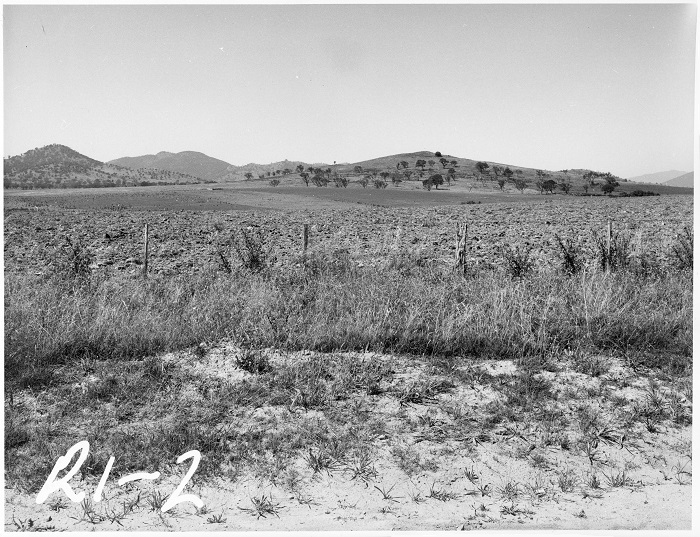 In November 1944, the RAAF proposed establishing a live bombing range adjacent to the existing Tuggeranong range. 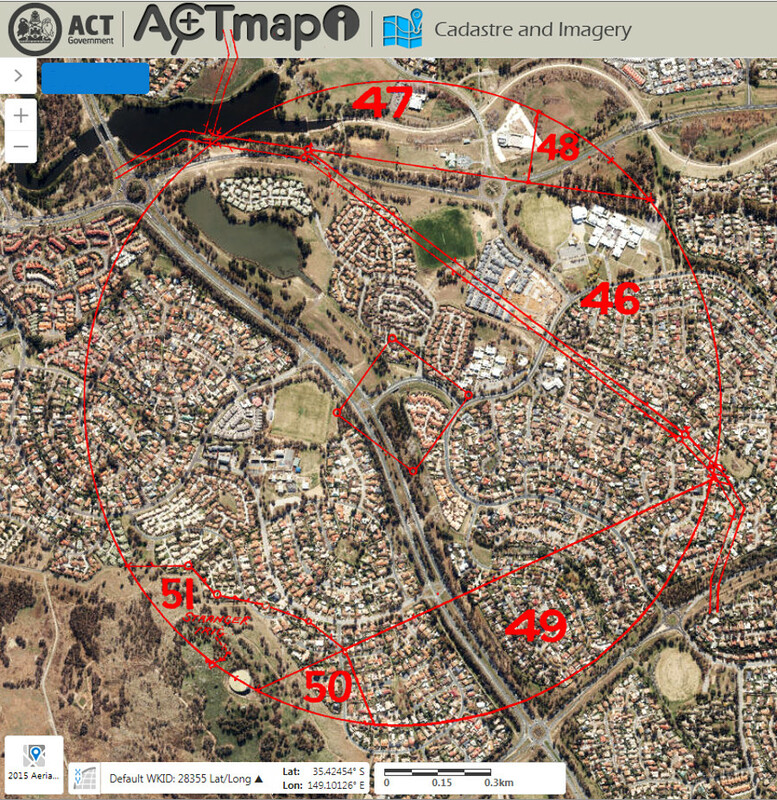 Located west of the Murrumbidgee River on the Soldier Settlement Block Paddys River 14A , the live bombing range covered four times the area of the Tuggeranong range. Surveyor-General, F.M. Johnston, immediately objected to this proposal. The target area included Point Hut Road and this would mean Point Hut Crossing would fall within the danger zone. At the time, this was the main route to Tharwa and the southern ACT as the "bridge there [at Tharwa] is closed and is unlikely to be repaired again in the near future." Brackenreg also expressed his "grave objection" to the proposal, stating that the concrete causeway built at "considerable expense" is "likely to be destroyed by the first bomber which passes over the area." He concluded that the DOI "will not agree to the location." "In view of the objections raised by your Department to the establishment of a live Bombing Range in the Point Hut Area, that proposed site has been abandoned and a Live Bombing Range in the ACT is not now contemplated." In June 1949, Surveyor-General J.N. Rogers queried the RAAF whether they still required the Tuggeranong bombing range, as they had not used it since the end of the war. The RAAF replied that they still required the range; however, in May 1952, they advised the DOI that the site was no longer required and "action is being taken to revoke the proclamation." This allowed the DOI to lease the entire block of Lanyon 10A back to Edlington. In the early 1970s, the National Capital Development Commission (NCDC) began preparation for the suburban development of Tuggeranong by resuming rural leases in the area. In 1972, the discovery of a small practice bomb on the former bombing range prompted the Department of Air to make a detailed examination of the area. As a result, they collected three tons of "scrap practice bombs." The Department of Air decided that a more thorough examination was required and sought details on the timing of NCDC contracts for roads and hydraulic services in the area. The plan was to excavate the target area to a depth of one metre, clear the area using metal detectors, then backfill the site. Detection equipment would also be used on the wider danger zone. The Department anticipated this process would take 12 months to complete. "Practically all the bombs were 8 ½ lb or 11 ½ lb practice bombs designed to merely create a puff of smoke on impact, hence even if there is an unexploded bomb or detonator, prejudice to eyesight or personal injury would be the primary concern." "A Small Demolition From Time to Time"
In June 1973, the Department of Air formed a small RAAF Unit that established a camp near the former bombing range and began clearing bombs from the site. In his book Service Tales and Other War Stories, John Clarkson describes the difficulties in locating small practice bomb fragments in the "heavy clay and rocky countryside, which already contained all sorts of scrap metal, including farming equipment, fence parts, etc." The Department expected clearing the area to be completed by July 1974. However, towards the end of 1973, it had already become apparent that these difficulties would lead to delays in clearing the site. By September 1974, one final impediment stood in the way of completing the job. The wire fences running along the length of the Pine Island Road interfered with the metal detectors so the Department of Air requested the Department of Capital Territory (DCT) remove them. The DCT were reluctant to do so as "this would create a potential fire hazard unless development followed closely on receipt of a clearance by the RAAF." The DCT eventually removed the fences in March 1975 and the RAAF Unit cleared the remaining area, completing the project in July 1975. The RAAF certified the site cleared in August 1975. "Of all these bomb heads, about 30 still had the detonator fitted. So, we had a small demolition from time to time. Although we hoped to find an old 500 pounder, which would have escalated the priority of the project, we never did." Despite the clearing carried out in the 1970s, bombs continued to be uncovered during the construction stage of Isabella Plains. In April 1984, the Department of Housing and Construction (DH&C) became aware of builders finding bombs. They checked with the Police who "verbally informed the bombs were 'dead' and so no problem." Further investigation found that some of the workmen who uncovered the bombs took them home for use as doorstops. In June 1985, the Electrical Trades Union (ETU) took industrial action after Telecom and ACT Electricity Authority (ACTEA) workmen, excavating service trenches, uncovered around 300 bombs in a two month period. ACTEA decided to withdraw all their employees from Isabella Plains, Chisholm and Gilmore until they could be sure of the site's safety. The Federal Police Bomb Squad was contacted and stated "they could not always be one hundred percent sure of the safety of such finds." However, after advice from the RAAF, the Union lifted their bans on the site and work on the suburbs resumed in July 1985. "Oh, in fact I wouldn't be surprised if people do. In building houses and digging foundations, they probably find these. Those areas have been ploughed over now, you know, every year since the war, and in the process a lot of casings probably are now metres deep. So it wouldn't be unusual for people in the future, in digging holes in their areas, to find the casings." If you do find remnants of these practice bombs, ACT Policing advise to leave the bombs undisturbed and contact them for their removal. Aerial photo of Bonython and Isabella Plains with the location of the Tuggeranong Bombing Range.